For every UFC star born is two or three hype trains destroyed. Doo Ho Choi was most recently trounced by Jeremy Stephens and Justin Gaethje was knocked out by Eddie Alvarez. This is a tough business and MMA stars are difficult to create. Come Saturday, Ngannou and everyone else will be reminded of this fact. The UFC hype machine can delude many into believing a fighter is better at the expense of underestimating their opponent. Ngannou (-165) is a wrecking machine and is rapidly improving. He set a UFC record for punching power although the previous record holder was a light heavyweight and it's unclear which other fighters got tested. And to borrow from Bruce Lee, "bags don't hit back." Ngannou is a budding star but this fight may not be his to win just yet. Miocic (+130) is the champion and is being awfully disrespected in this spot. Ngannou can put away any man who he touches clean and this is why he's the favourite here. But in his brief career, Ngannou has only three KOs while the rest are decisions or technical knockouts. He has the size and reach advantage and Miocic has struggled against long opponents like Stefan Struve. But his secret weapon would be his experience and veteran savvy. Miocic has fought power punchers like Ngannou but Ngannou hasn't fought a complete MMA fighter like Miocic. The champion is adept at risk management and if and when he gets hurt, he is wise enough to get himself out of harm's way. Miocic has been rocked in his previous fights but finds a way to come back. Ngannou has suspect endurance and if he can't finish Miocic within the first two rounds, the fight will sway in favour of Miocic. He knocked out Overeem and Andre Arlovski quickly but these were two aging fighters who didn't have the wrestling prowess and heart of Miocic. 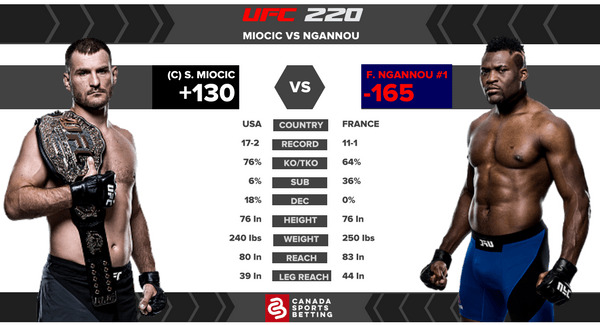 Prediction: Ngannou could knock Miocic's head off in two rounds. But Miocic will level-change and grind him out using his smart boxing and exhaustive wrestling. Ngannou has great takedown defence but he'll spend a lot of energy defending. By the time Ngannou starts slowing down, Miocic will take over and make his most emphatic statement as UFC champion. Lock it Up! For Daniel Cormier (-350). Like Miocic, Cormier is facing a renowned knockout artist in Volkan Oezdemir (+255). Oezdemir will have to knock Cormier out cold to win but DC is familiar with neutralizing heavy-handed strikers in the past. He'll outwrestle Oezdemir, wear him out, and finally finish him. Who's A Good Dog? The hometown hero Calvin Kattar (+150) is a decided underdog despite being almost as good as Shane Burgos (-190). Kattar isn't as good of a striker or wrestler but he is savvy and has a great coach. Plus, the hometown bias could help sway judges to his favour in a close fight. Just Say No: to Enrique Barzola (-250) versus Matt Bessette (+185). The Peruvian favourite should win this fight as he is the better fighter all-around but that price is pretty steep and Bessette isn't big enough to warrant a dog bet. Pass! The first UFC pay-per-view is top-heavy and promises some serious knockout and/or upsets. Canadians are ecstatic to see these fights turn out and turn to Canadian-friendly sportsbooks, which aren't limited to just MMA but also offer other sports like hockey, soccer and even tennis.